The Hercules BS118BB is a sturdy sheet music stand that comes with a.. 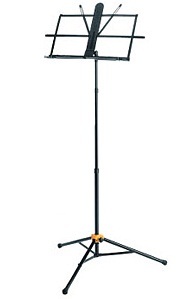 The Hercules BS118BB is a sturdy sheet music stand that comes with a handy carrying bag. The Hercules BS118BB is made to be easy to set up with an EZ Grip one-handed height adjustment, 3-section fold-down design. Weighing just 1.7 kg, the BS118BB is extremely light and portable and with a height-adjustable design from 53 to 123 cm, it is ideal for musicians of all heights and ages. Weight: 1.7 kg / 3.7 lbs. Load capacity: 3 kg / 6.6 lbs.